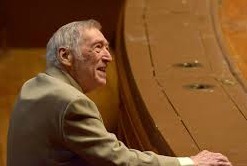 Gunther Schuller, who was prominent in classical music and stimulated attention to a hybrid movement in jazz, died today in Boston. He was 89. In addition to his authorship of influential modern classical pieces, Schuller in the late 1950s melded jazz and classical influences and came up with a label for it that stuck: Third Stream. In the l960s and l970s he was president of the New England Conservatory. His classical composition “Of Reminiscences and Reflections” won a Pulitzer Prize in 1994. In jazz, Schuller first won prominence playing French horn in Miles Davis’s 1949/1950 Birth Of The Cool ensemble. Later in the fifties, he, Davis, John Lewis, George Russell, Charles Mingus and others made Third Stream music a phenomenon that has left a lasting impression. His “Symphony for Brass and Percussion” is an example his marriage of idioms. In this conversation with Frank J. Oteri of the New Music Box website, Schuller discusses several aspects of his career, including his use of the twelve-tone row in composition and the system in the top levels of the jazz community for endorsing new talent. For expanded thoughts on Schuller and the Third Stream, see this Rifftides entry from five years ago. I will have more about him in the next post. A friend of ours, the now late John Good, kept hoping that Mr. Schuller had enough time left for the third part of his trilogy of books, that on modern jazz. Now he has gone, too, but here’s hoping that the book is in the works, or in someone’s competent hands. When I started the whole thing in 1957 with the Third Stream … it was extremely controversial. I was vilified on both sides. Classical musicians, composers and critics all thought that classical would be contaminated by this lowly jazz music, this black music. And jazz musicians and critics said, ‘My god, classical music is going to stultify our great, spontaneous music.’ It was all nonsense and ignorance, of course. Eventually the two came together anyway. Works like Gershwin’s “Rhapsody In Blue” were written in 1924, thirty-three years before 1957. Gershwin’s “Concerto in F” followed in 1925. George Antiel’s “A Jazz Symphony” was also written in 1925. Arthur Honegger’s “Concerto for Piano” in in 1925. Ernst Krenek’s “Johny Spielt auf” in 1926. Ravel’s “Piano Concerto in G” in 1926. Copland’s “Clarinet for Concerto” in 1948. Boris Blacher’s “Concerto for Jazz Orchestra” in 1948. Many other examples could be listed, including Stravinsky’s “Ragtime for 11 Instruments” written in 1918. Concerning jazz and classcial fusion, Schuller didn’t “start the whole thing in 1957,” but he did continue an important tradition. Those compositions were all through-composed pieces utilizing idioms from jazz music. Other composers had written aleatoric music that did involve some improvisation but no jazz idioms or jazz musicians. So, in a sense, the music pioneered by Schuller and colleagues was something new.